It is shown elsewhere that drilling on a milling machine has several very useful advantages, in particular when the milling machine is fitted with DRO’s. 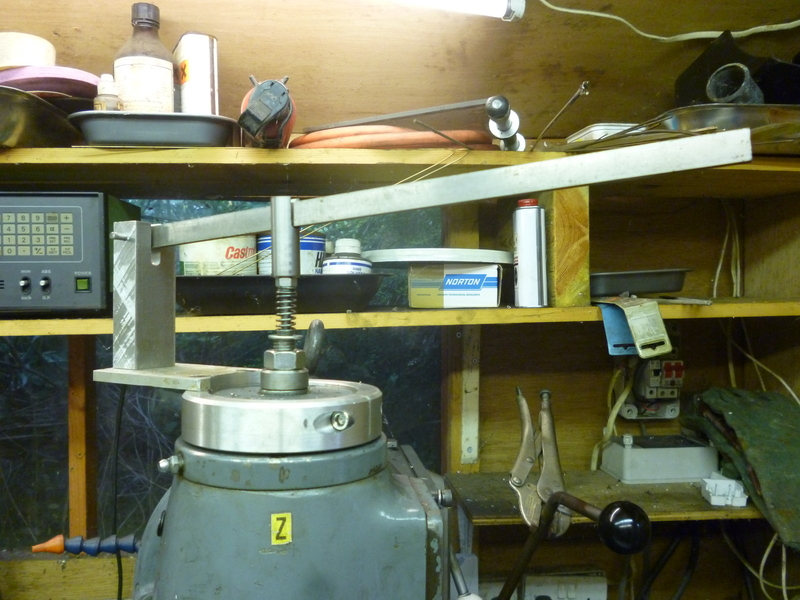 However this assumes that the milling machine has a quill feed. If the milling machine does not have a quill feed then drilling a large number of holes becomes hard work. It is possible to fit something that simulates a quill feed to a machine without it having one. What is required is some means of holding a drill bit. This has to be driven round by the spindle. 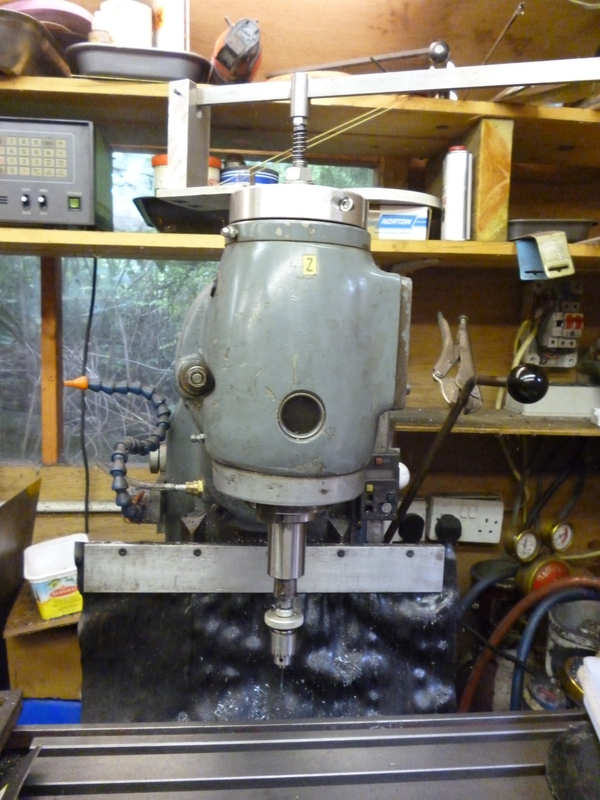 It also has to be possible for the drill bit to be lowered into the workpiece. The trick is to use a drawbar that has a hole drilled right through it. This is used to push the drill chuck down as required. 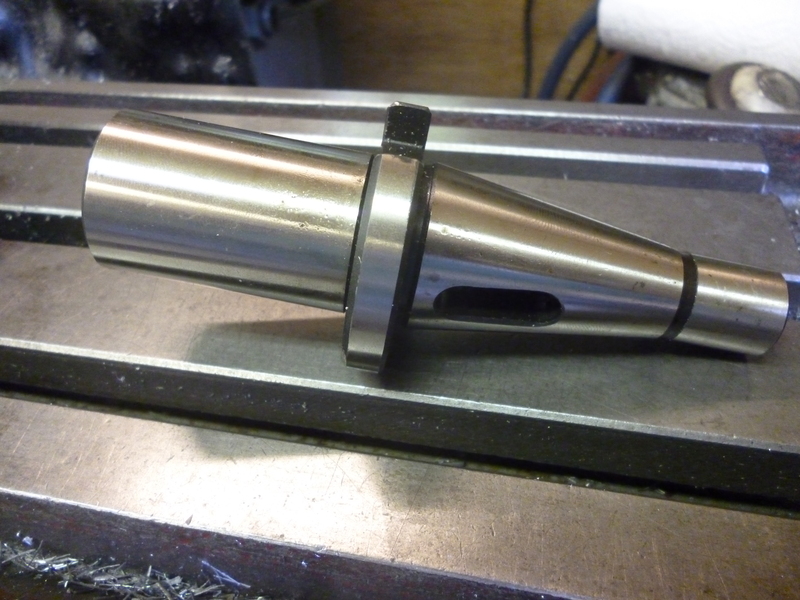 This is merely be used as a taper to fit the drill chuck which has a parallel shank. This shank will slide up and down inside the next component. notice it has a small groove milled in it. This is so the drive from the spindle drives the drill chuck. It also has a 3mm grub screw near its end. This screw fits a groove on the pushrod. This means this part can rotated without the pushrod rotating whilst at the same time it can be pushed down or pulled up by the pushrod. The cap screw at the left end is to stop the prt holding the drill chuck from rotating in the rest of the assembly as it would if being used a a standalone drilling device. All of this fits in the next component which is simply a tapered sleeve bored out to take the parallel part of the assembly shown above. Note the grub screw that fits in the groove on the previous part. All of the fits in a standard Morse 3 taper to int 30 adapter. 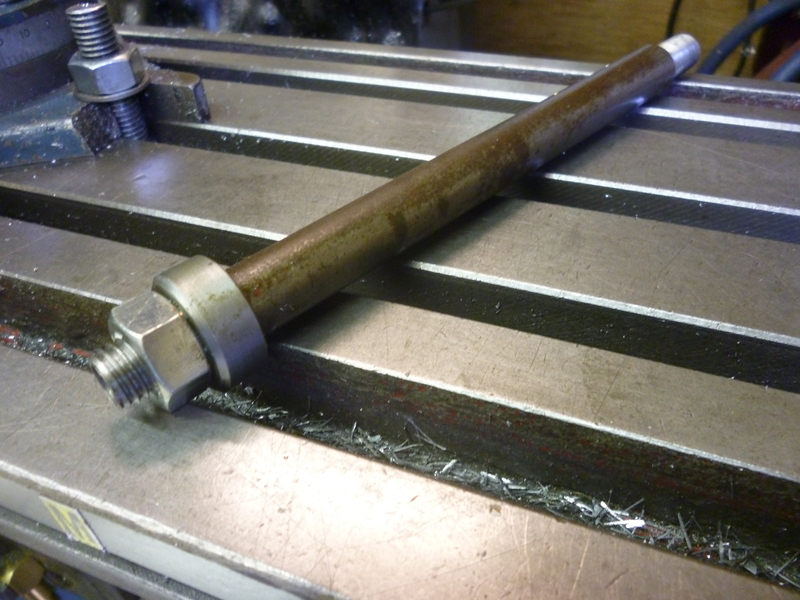 This taper has to be hammered hard into the adapter to stop it falling out or rotating. fig Morse 3 taper to int 30 adapter. 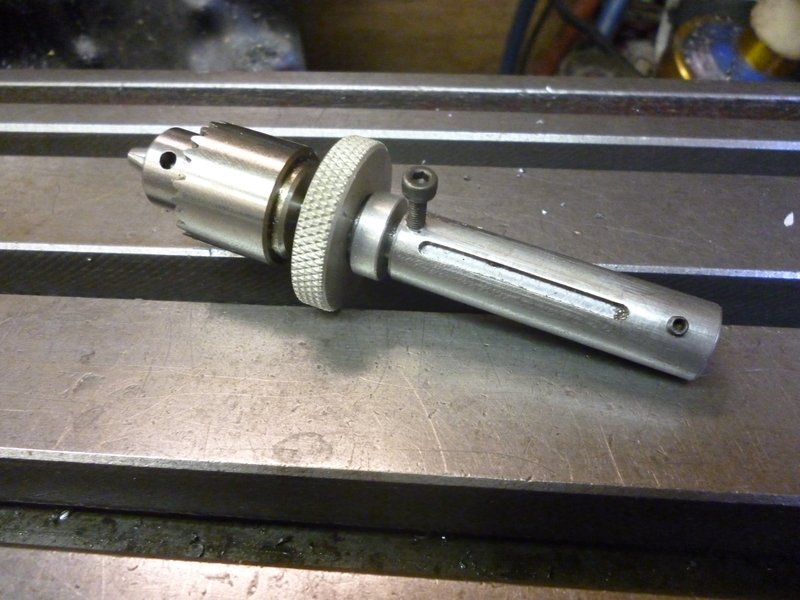 This adapter is fitted into the socket on the spindle using a special drawbar. This has a hole running all the way throught it. This take the push rod. 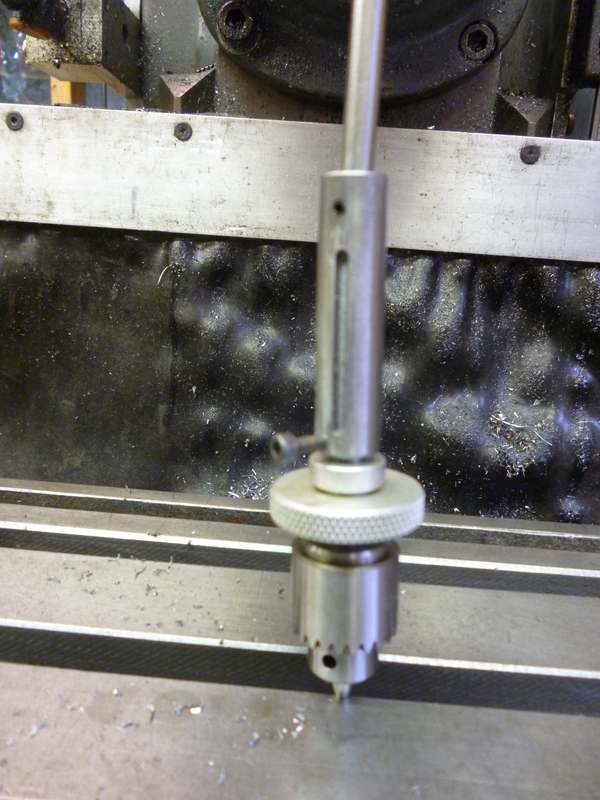 On the top of the vertical milling head is a lever for pushing down the pushrod. There are also some springs so the pushrod will automatically lift unless pushed down. In use the push rod is too long to be fitted from underneath and has to be fitted from the top. It is then connected up to the parts underneath the vertical head. 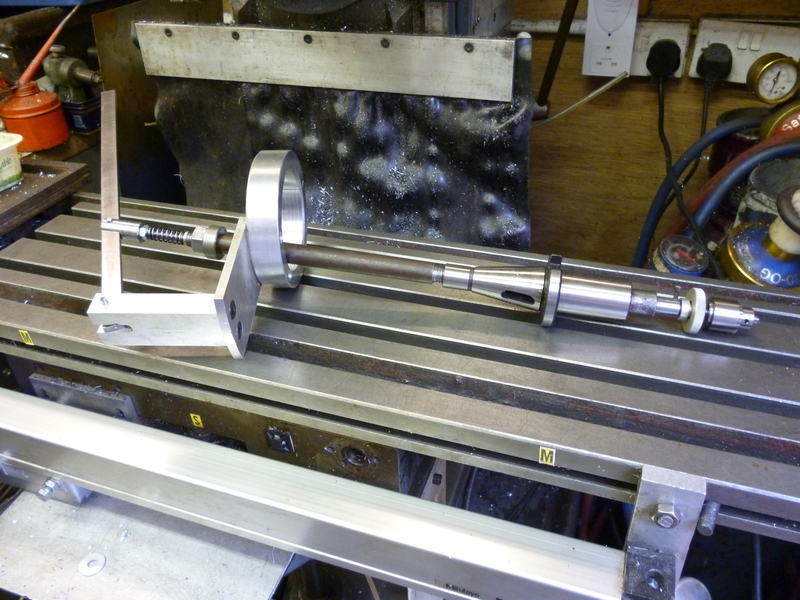 The whole assembly is shown not fitted to the milling machine to show how it all fits together. A pin has been added to join the handle to the top of the push rod assembly. 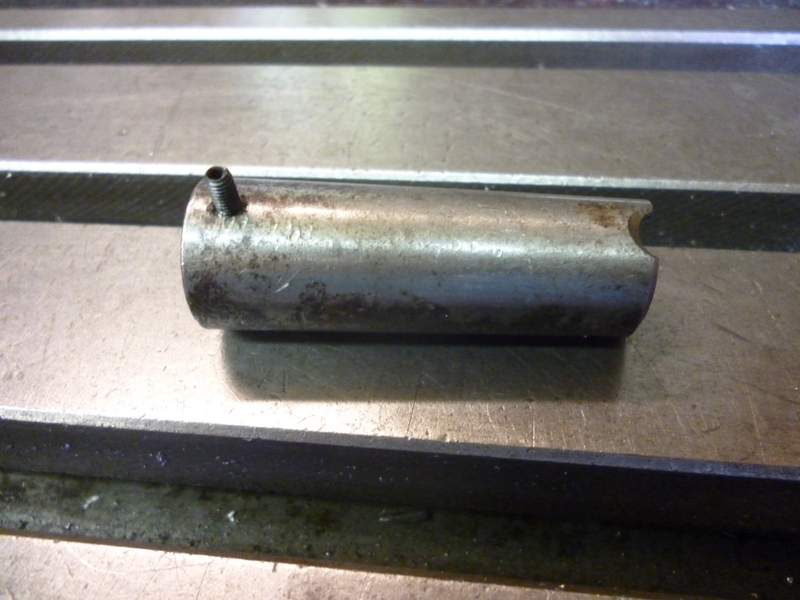 A bush has also been insert between the pushrod and the inside of the drawbar. These measures make the whole system running more smoothly when in operation.